Reading about Hurricane Sandy's devastation on the east coast is horrifying. New England is home for us and our hearts and thoughts have been with family and friends as they have been struggling with floods and fires in their communities on the coast. It's impossible to wrap your head around such an enormous amount of complete and utter destruction. Watching the news reports is painful. Floods, fires, evacuations, death, looting. . .
And yet. Yet, there are still beams of hope, of goodness. 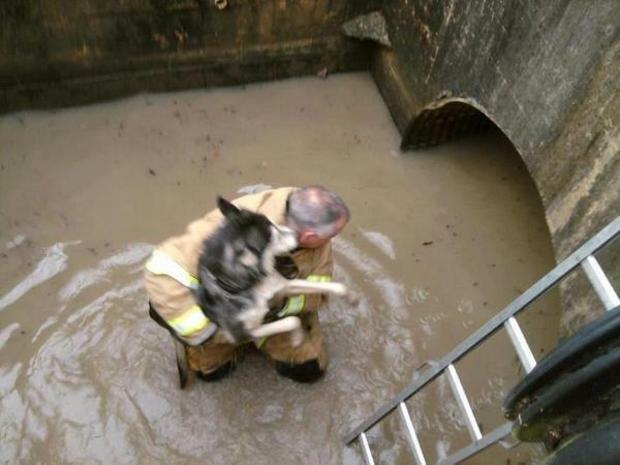 The strangers who rescued wet, scared dogs, stranded in rising waters. Neighbors who welcomed people into their homes when nearby houses were carried out to sea. Zoo workers who stayed overnight in case the animals needed them. As I read about these regular people who rose to the occasion of supporting each other in crisis, I felt hopeful. When I was a little girl my grandmother taught me that true compassion means caring for someone you don't know. I am keeping this in mind today as we watch heroes helping others in the midst of catastrophic destruction. If you are in the catastrophe zone, our hearts goes out to you. When the time comes to start fundraising and rebuilding, we're there. If you are lucky enough to be safe and dry today, take this day to give thanks by helping someone else. How? Buy the groceries for the elderly person in line in ten items or less line in front of you. For today, let's try to put good karma out in the universe. Maybe this force is strong enough to calm the very ticked off Mother Nature.